Keyword research is really the basis of all search engine optimization work you’ll do. Without strong keywords, you can tweak your website copy for weeks and never see higher search rankings or click-through rates. So now you’re probably wondering how to conduct keyword research, especially on a budget. Don’t worry - I’ve got you! Use these simple steps below - utilizing some great free SEO tools online - and you’ll be on your way to page one in Google! Pro tip: this 5-step process does not need to take forever. You could spend hours gathering a list of keywords a mile long, but it doesn’t have to be that complicated. I recommend spending about 10-15 minutes on each stage of this strategy, meaning that in just one hour you’ll be done with keyword research and on the path to better search engine rankings! Step One: Analyze your own business. This first step in keyword research is simple and requires only a little bit of research. You know your business and you know the kinds of questions and inquiries you get from your customers and potential customers. Think about not only the words you use to describe your business, but the words your customers use and the words they may use to search for the answers to their questions. You may want to look back through customer emails to see the exact phrasing that is most often used, or review the way people talk about your product or service on social media. Write these keywords down to start your master keyword planning list. The next part of analyzing your own business involves one of my favorite free SEO tools: Google Search Console. If you haven’t used Google Search Console before, you’re going to be pretty impressed. Simply visit the Google Search Console website and log-in with a Google account to claim your domain. Once your domain is registered, you’ll be able to review search data for website and actually see a list of all the keywords that have brought visitors to your website. There’s no need to guess which of your keywords is successful, you’ll be told based on actual Google search data. Add these to your master keyword list (omitting any repeats) and we’ll move on! Step Two: Analyze your competition. While I never advocate for copying your competition and am a big believer in escaping the trap of constant comparison, it is important to determine the kinds of keywords your competition is ranking for. Start by visiting their websites. A simple look through their site and the kind of content they use can give you some great ideas for new keywords. Perhaps they regularly use an industry term you hadn’t thought to incorporate into your content or use blog posts to answer commonly-asked questions. While you shouldn’t copy any of their work directly, you can get some great ideas for new content and add these keywords to your list. Next up, it’s time to figure out which keywords your competitors are actually ranking for, and which keywords their customers (and your potential customers) are using to find them. To do this, I use two of my favorite free keyword research tools: SEMRush and BuzzSumo. Let’s start with SEMRush. You may have to sign up for a free trial, but no credit card is necessary (score!). On the SEMRush dashboard, simply select “Domain Analytics,” type in a competitor’s URL and you’ll be given a list of keywords they rank for. When I typed in my own website, for example, I was given a list of keywords including small business branding package, logo design NH and business branding packages. Any keywords that your competitors rank for should go on your keyword research list. BuzzSumo is another great tool for keyword research, allowing you to review your competitor’s sites to see which of their content is the most popular on social media. You can bet that if their content is ranking well on social media, it’s because it’s exactly the kind of information that your ideal clients are looking for. Pay attention to the topics and keywords used in this content and add them to your keyword list (omitting any repeats). In the example below, I reviewed Buzzfeed’s content (simply because I love Buzzfeed and wanted to see what they were up to). You can see from the image below that you can dive even further into each result, to see backlinks to each piece of content, sharers and more. The backlink information is especially great, because you can bet if a site is linking to one of your competitors, they may want to link to your site as well. Step Three: Identify long-tail keywords. My favorite long-tail keyword generator is a tool your mostly likely already using: Pinterest! (Whoa, crazy right? More on that in a minute). So what are long-tail keywords, anyway? Long-tail keywords are longer phrases and strings of multiple words. These are incredibly powerful for boosting your search ranking because they reflect the way most people search online. A good example is a question that someone might type into Google. If you’re wondering how to create a visual brand for your small business, you’re likely not going to just type in “small business brand.” Nope, you’re much more likely to type in “how to create a small business brand” or some similar version. Ok, so where does Pinterest come in? While you can probably identify some good long-tail keywords on your own based on questions customers ask, the location of your business and the specific details of your particular offer, Pinterest is a treasure trove of long-tail keywords ideas you may never have thought of. And you don’t even have to delve further than the search bar. You see, Pinterest is basically a search engine, and it has a great predictive search tool. All you have to do is start typing in a keyword and Pinterest will automatically generate long-tail versions of that keyword based on what people are searching for. As an example, I started typing “small business” into the Pinterest search bar. 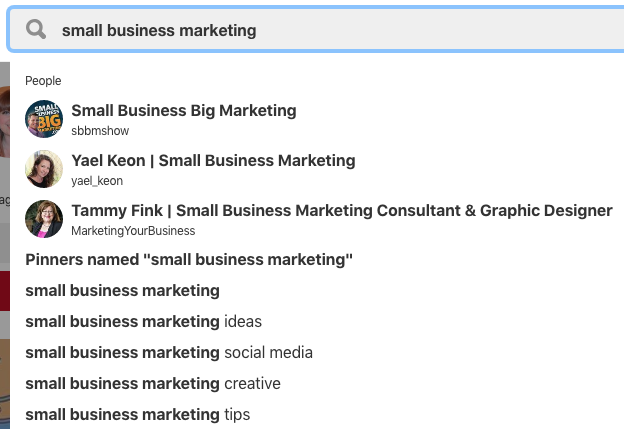 Without even hitting search, the predictive search bar gave me people and boards I might want to follow and also provided a list of long-tail keywords like “small business marketing” and “small business organization.” Those are great ideas on their own, but I wanted to go even more in detail. Search for your top keywords in Pinterest and you’ll find some great long-tail keyword suggestions that you can be confident others are looking for! Add these long-tail keywords to your master list. Step Four: Find related SEO keywords & review the quality of your master list. By this step, you should have a pretty long list of keywords going, and it’s about to get even longer, thanks to a new SEO keyword research tool called Ubersuggest. Ubersuggest was created by the incredibly knowledgeable Neil Patel, my go-to SEO guru and can be used to not only find new keywords, but also determine the quality of the keywords already on your list. Ubersuggest does exactly what it sounds like: it suggests keywords related to a submitted query. Better yet - it’s 100% free! Simply head to the Ubersuggest site, grab your keyword list and start researching. To start, add a keyword to the search bar and click search. You’ll be given search data for the keyword you typed in, including monthly search volume, cost-per-click for paid search and how easy it is to rank for that keyword (as shown in the image below). You’ll also be given a list of related keywords, with the same detailed search information for each. Click on any keywords generated and you’ll get even more detailed information on this keyword. I recommend using Ubersuggest to not only find new keywords for your list, but to also determine the quality of your keywords and figure out which are best for use on your website. The best keywords are those with a high search volume but low competition, meaning it will be easy to rank for these keywords and you’ll reach lots of potential visitors when you do. Go through your list of keywords and highlight those with low competition and high volume. Add any new keywords from Ubersuggest that meet this same criteria. Don’t remove a keyword from your list just because it might be difficult to rank for or has a low search volume - these can still be used as supporting keywords in your content. Step Five: Optimize your content for search engines (and humans). This is where all your keyword research is put to use. Now that you’ve got an awesome list of keywords that convert, it’s time to optimize your content and start driving more traffic to your site! Start by determining which keywords best fit each of your existing web pages. If there are some keywords you’d love to use that don’t really fit with any of your pages, it might be time to add a new page to your site! Adding an FAQ page is a great way to answer common questions and use a bunch of keywords. Adding a blog to your website is another great way to build content around your new keyword list. For each page of your website, you’ll want to identify a “focus keyword,” or the keyword that you’re really trying to rank for. You’ll also want to identify some secondary keywords, related words that tie into the topic you’re writing about and will help Google and your readers recognize your content as reliable. Page Title - This is the title displayed in a Google search result. Slug - This is the actual URL for your webpage. 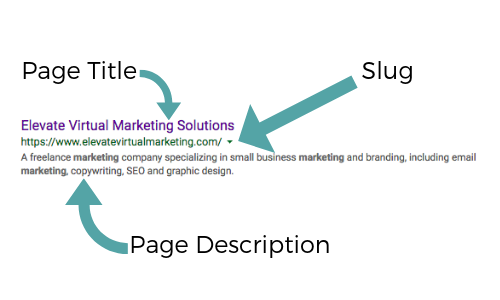 Page Description - This is the short blurb of text displayed in a Google search result. Page Headers - These are the titles you use throughout the content of your page. Body Copy - This is the content of your page itself. Image Captions, Alt Tags and File Names - Don’t overlook your images - they play an important role in SEO! Of course, sprinkle your secondary keywords throughout your content as well. But be careful to avoid “keyword stuffing.” You don’t need to use each keyword 15 times for your page to rank. In fact, overusing keywords or using them in ways that aren’t in line with natural speech, can actually hurt your ranking. To test your optimization work, I love using yet another free tool: Yoast’s Real-Time Content Analysis tool. Simply plug your content into this analysis tool and it will not only tell you what you’re doing right, but also provide suggestions on what you could do better. It’s a game changer for creating content that drives traffic! With these simple tips you’re already on your way to better keyword research. Better yet, you’ve done it in less than an hour and without paying for any expensive tools! Keyword research doesn’t have to be overly complicated, but it can be overwhelming. If you need help with this work, don’t hesitate to reach out. I’m passionate about helping small businesses succeed with search engine optimization, and would be happy to talk with you about how I can help your business grow. 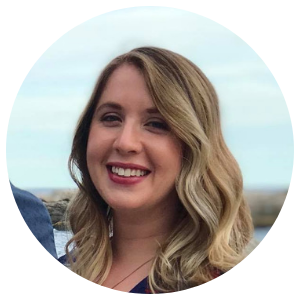 Click the link below to get in touch, or visit my services page to see all of the freelance marketing help I offer to local New Hampshire small businesses and business nationwide!